London Underground (LU) today confirmed that plans are in place to start construction work on the extension of the Metropolitan line next year, with the aim of completing the transformative new link in 2020. Over 6,500 permanent jobs and a 2bn boost to the local economy will be created as two new stations are built at Cassiobridge and Watford Vicarage Road, served by new walk-through air-conditioned trains every ten minutes to and from central London during peak hours. The Metropolitan Line Extension will support growth and regeneration in and around Watford by making journeys to and from London easier. 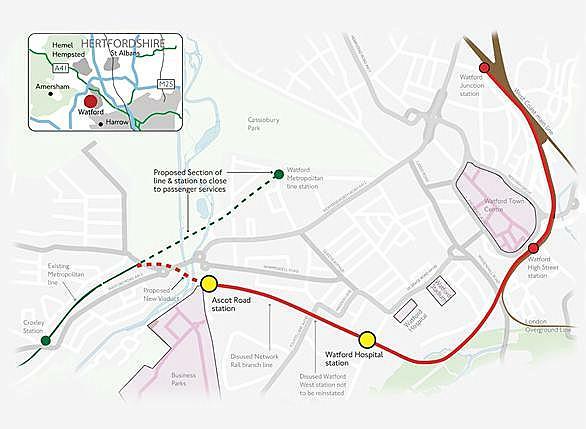 The Underground will be connected to the West Coast Mainline via the station at Watford Junction, and the two new stations will also provide new connections to Watford General Hospital and new Health Campus, Croxley Business Park and Cardiff Road Industrial Estate. A full funding package for the extension has now been agreed between the Department for Transport (DfT), Hertfordshire County Council and Transport for London (TfL), and the work will be delivered by LU. The existing Watford Metropolitan station will close to the public following the opening of the new stations, but will be retained as sidings for the extended railway. Manny Lewis, Managing Director for Watford Borough Council, said: "The Metropolitan Line Extension to Watford is a key transformational project for the town - its residents, visitors, businesses and investors. As well as providing significantly improved transport choices for local people, the project is absolutely critical to unlocking Watford's future economic and regeneration potential. The extended Metropolitan Line will bring over 1.4bn of investment into the town, helping create thousands of jobs by supporting the delivery of major projects like the Watford Health Campus, Watford Business Park, Ascot Road and the redevelopment of Charter Place Shopping Centre. We have worked really hard behind the scenes with key stakeholders and funding partners to help make this happen and look forward to supporting London Underground Ltd as they work towards physically delivering the project on the ground."